Credit: MODIS Mosaic of Antarctica (MOA) Image Map / Anne le Brocq. An ice channel stretching hundreds of kilometers and reaching as high as 250 meters have been discovered under a floating ice shelf in Antarctica. The ice shelf was discovered using satellite image and radar measurements from the sky. Based on the data recorded, the channel is as tall as the Eiffel tower. The image map from the MODIS Mosaic of Antarctica (see image above) shows the ice shelf channel as it aligns the flow route of the water under the ice sheet and the start of the ice shelf cannel. The dashed line marks the border where the ice leaves solid ground and starts to float on the ocean surface. Ice shelves are thick platforms of ice 100 to 1000 meters thick that forms where a glacier or ice sheet flows down to a coastline and onto the ocean surface; similar to a pier or a dock. These can only be found in Antarctica, Greenland and Canada. Around 44% of the ice shelves are connected to the Antarctic coastline covering an area of 1,541,700 km². 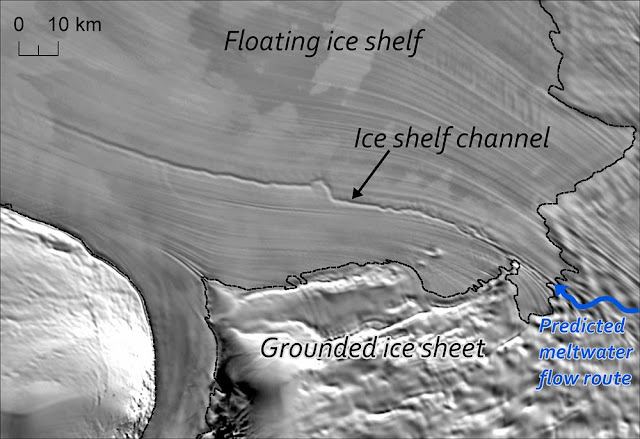 In the image map above, the part of the ice sheet between the grounded ice (part of the ice shelf that rests on bedrock) and the floating shelf (on the ocean surface) is called the grounding line. 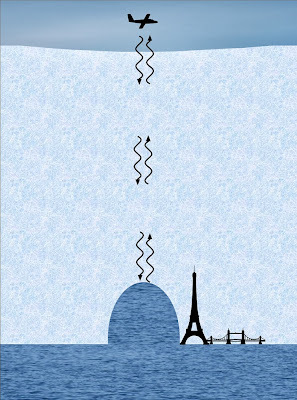 This is a schematic diagram indicating the approximate scale of one of the ice shelf channels, similar in height to the Eiffel Tower, and Tower Bridge in width. Scientists have discovered huge ice channels beneath a floating ice shelf in Antarctica. At 250 meters high, the channels are almost as tall as the Eiffel tower and stretch hundreds of kilometers along the ice shelf. The channels are likely to influence the stability of the ice shelf and their discovery will help researchers understand how the ice will respond to changing environmental conditions. Researchers from the University of Exeter, Newcastle University, the University of Bristol, the University of Edinburgh, the British Antarctic Survey and the University of York, used satellite images and airborne radar measurements to reveal the channels under the ice shelf. The channels can be seen on the surface of the ice shelf, as well as underneath, because the ice floats at a different height depending on its thickness. The researchers also predicted the path of meltwater flowing under the part of the ice in contact with the land – known as the ice sheet. They discovered that the predicted flow paths lined up with the channels under the ice shelf at the point where the ice starts to float. The match-up indicates that the water flow beneath the grounded ice sheet is responsible for the formation of the channels beneath the floating ice shelf. When the meltwater flowing under the ice sheet enters the ocean beneath the ice shelf, it causes a plume of ocean water to form, which then melts out the vast channels under the ice shelf. Previously, it was thought that water flowed in a thin layer beneath the ice sheet, but the evidence from this study suggests it flows in a more focussed manner much like rivers of water. The way in which water flows beneath the ice sheet strongly influences the speed of ice flow, however, the implications for the future of the ice sheet are yet to be determined. Dr Anne Le Brocq from the University of Exeter said: "If we are to understand the behaviour of the ice sheet, and its contribution to changes in sea level, we need to fully understand the role of water at the base of the ice sheet. The information gained from these newly discovered channels will enable us to understand more fully how the water system works and, hence, how the ice sheet will behave in the future." Channels of this magnitude have been observed before elsewhere, but their formation has been attributed to purely oceanic processes rather than meltwater exiting the grounded ice sheet. Now, with the connection to the meltwater system established, readily obtainable observations from the channels have the potential to shed light on how meltwater flows at the base of an inaccessible kilometer-thick ice sheet.